On July 1, 2016, the U.S. Court of Appeals for the District of Columbia Circuit (D.C. Circuit or court) issued a decision that could have sweeping rate implications across the entire interstate pipeline industry. United Airlines, Inc. v. FERC (United Airlines) calls into question a decade of Federal Energy Regulatory Commission (FERC) policy and precedent permitting regulated companies organized as pass-through entities for income tax purposes to include an allowance for income taxes in their rates. The court found that FERC had acted arbitrarily and capriciously when it permitted SFPP, L.P. (SFPP), an interstate petroleum products pipeline, to include an income tax allowance in its rates. The court agreed with SFPP’s shippers that FERC failed to demonstrate that the tax allowance would not result in the pipeline’s partnership owners double-recovering their income taxes in SFPP’s rates. In United Airlines, the D.C. Circuit seemingly reversed its 2007 decision in ExxonMobil Oil Corp. v. FERC (ExxonMobil) also concerning a tax allowance granted to SFPP. This latest decision could fundamentally change FERC’s 10-year old income tax policy and undermine the existing rates of interstate oil and gas pipelines organized as limited partnerships. FERC adopted its current Policy Statement on Income Tax Allowances (Policy Statement) in 2005. 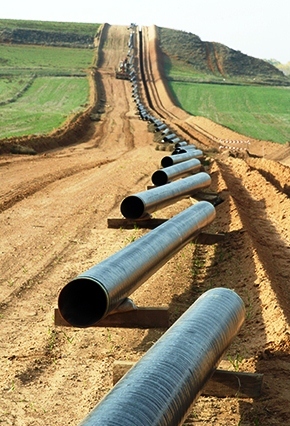 The Policy Statement permits partnerships or similar pass-through entities that hold interests in a regulated public utility, including oil and natural gas pipelines, to earn an income tax allowance if the utility can demonstrate that its eventual owner or owners have an actual or potential income tax liability payable on the income earned on the assets held by the pass-through regulated utility. The Policy Statement was upheld by the D.C. Circuit in 2007 in ExxonMobil. In United Airlines, SFPP shippers alleged that the Policy Statement, as applied to SFPP, permitted SFPP’s partners to double recover their taxes in SFPP’s rates. Shippers argued that the discounted cash flow (DCF) methodology that FERC uses to determine a regulated pipeline’s return on equity already ensures a sufficient after-tax return to attract investment to the pipeline. The court accepted this premise. In doing so, the D.C. Circuit narrowed its earlier holding in ExxonMobil. According to United Airlines, ExxonMobil did not permit FERC to allow a blanket income tax allowance for all partnership pipelines. Rather, it only permitted a tax allowance when FERC has provided a reasoned basis for the allowance. The court stated that ExxonMobil had implicitly reserved the question of whether the combination of the DCF return on equity and the tax allowance resulted in a double recovery for partnership pipelines. It determined that FERC had not adequately answered this question for SFPP in the decision under review. The court listed three facts supporting its conclusion that FERC had failed to demonstrate no double recovery by a partnership pipeline: (1) a partnership pipeline, unlike a corporate pipeline, incurs no taxes at the entity level; (2) a discounted cash flow return on equity determines the pre-tax investor return required to attract investment, irrespective of the pipeline’s corporate structure; and (3) a partner in a partnership pipeline will receive a higher after-tax return than a shareholder in a corporate pipeline if permitted to receive a tax allowance, at least in the short term before adjustments can occur in the investment market. The court also referenced the standard for setting just and reasonable rates set forth in the U.S. Supreme Court’s 1944 landmark Federal Power Commission v. Hope Natural Gas Co. decision. This standard provides that a pipeline’s equity owners must be permitted the opportunity to earn a return that is “commensurate with returns on investments in other enterprises having corresponding risk.” United Airlines accepted the premise that a pipeline organized as a partnership carries a similar level of risk as one organized as a corporation. It explained that ExxonMobil did not absolve FERC of its obligation to ensure parity between the equity owners of both pipeline types. The court held that FERC’s failure to perform this type of risk analysis rendered its underlying decision on SFPP’s rates arbitrary and capricious. The court remanded the case to FERC to allow it to have an opportunity to provide a reasoned basis for its decision on income tax allowances for partnership pipelines. The court noted that FERC had previously considered the possibility of setting rates based on pretax returns and eliminating the income tax allowance. In light of the large number of jurisdictional entities organized as pass-through entities, this will be a major issue for FERC to address. Because FERC addressed this issue through a policy statement previously, it is likely to follow the same path now in light of the United Airlines decision.